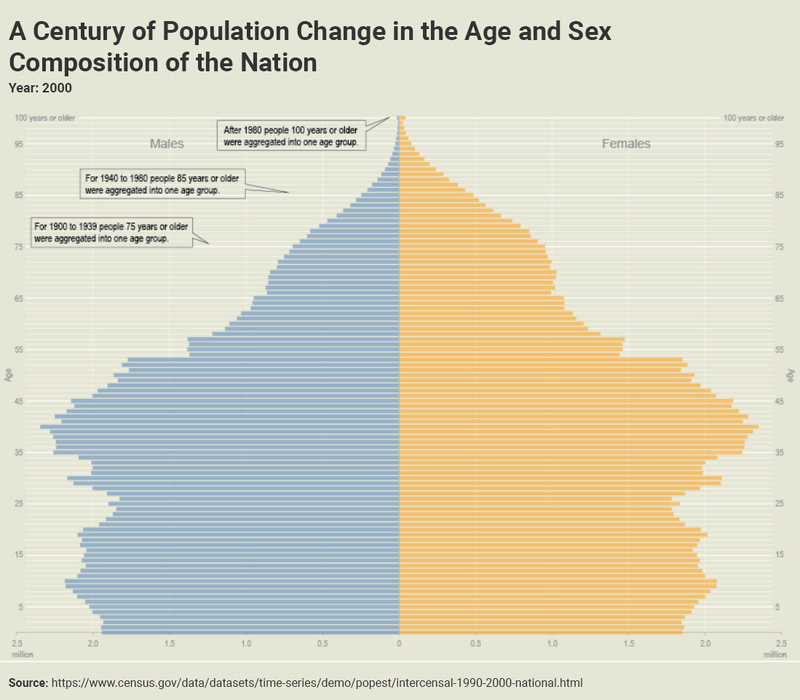 A population pyramid is a graphical illustration of population distribution across different age groups and genders. Population pyramids consist of a series of histogram bars on opposing sides, with one side representing male and the other female. Each row (or bin) of a population pyramid represents an age group and together they form the shape of a pyramid. Place the y-axis in the middle of the x-axis at the zero marker. Display males on the left and females on the right. Display age groups on the y-axis and population size on the x-axis. Never use more than two colors. Alternate between two shades of color for each row for improved legibility. Leave space between each row. Label the y-axis on boths sides of the chart. Use different colors to represent male and female. Don’t label the y-axis in the center of the chart.